PREMIUM PACKAGE - TrailMaster Mid XRX Go Kart - ASSEMBLED - Ships FREE!!! In Stock. FREE Shipping. No Hidden Handling Fees. 1 Year Warranty Including Engine. * FREE Liftgate Delivery. Approximately 20 minutes Prep Time. Install Top Bars. Battery. Headrests. The reviews are in, and the TrailMaster Mid XRX/A go-kart is a customer favorite. With go-kart riding as great family adventure, you want to make sure your kids start out with the right kart. This is why the TrailMaster Mid XRX was created. This go kart is a perfect combination of fun, agility, reliability and easy operation. The TrailMaster Mid XRX go kart is the best built mid-size youth go kart on the market. This offroad go-kart was designed for a 6 year old to a 12 year old rider but can accomodate a small to average size adult. The seating area is roomy enough for an adult plus an average sized 8 year old. The TrailMaster Mid XRX has an adjustable driver's seat so that two different sized riders can ride without being uncomfortable. The Mid XRX has high side rails, tall top bars for plenty of head room and 5-point seat belts for a safe and comfortable ride. This go kart has large tires and fenders and can accomodate open grass fields, gravel driveways, pastures and intermediate trails. The TrailMaster Mid XRX is built tough with an automotive inspired steering and front suspension. The front spindles are tall, which add strength, and the rack and pinion makes for quick and easy turning. The TrailMaster Mid XRX incorporates a short wheel base for tight turns. The top speed of the Mid XRX is easily adjusted at the pedal from 30 mph down to 8 miles per hour. The Mid's engine is one of the most popular designs in the world with all parts readily available. The TrailMaster Mid comes to a quick stop with hydraulic disc brakes for both rear wheels. Engine Type: 4-Stroke, Single Cylinder Clutch: Automatic CVT Wheelbase: 48.4"
Horsepower: 6.5 hp Brakes: Rear Hydraulic Disc Weight: 330 lbs. Starting System: Electric w/ Backup Recoil Front Tire: 16 x 6 - 8 Max Load: 400 lbs. Battery: 12V Rear Tire: 16 x 7 - 8 Pedal to Seat Back: 31.5" to 36"
The TrailMaster Mid XRX go-kart is the best mid size kids go kart on the market. It features a very simple CVT drive system which is superior to the 110cc and 125cc go-karts with complicated gearboxes that are difficult to operate and know to have excessive failures. The Mid XRX electrical system is simple. The go kart can still be operated even if all of the wires are removed because of the pull recoil starter and self-contained engine (ignition, carburetor, and muffler are made to the engine). The TrailMaster Mid XRX is tough and loaded with standard features and optional reverse (Mid XRX-R only). The Mid XRX has the following upgrades compared to the TrailMaster Mid XRS. At GoKartMasters.com, you will get detailed, accurate information that's hard to find elsewhere regarding go karts for sale. That's because we have assembled, serviced and tested the products ourselves before deciding to sell them exclusively online. Our go-kart industry experience is second to none. We stay on top of new products and designs to help people make informed choices. We stock all of the TrailMaster go karts for sale. 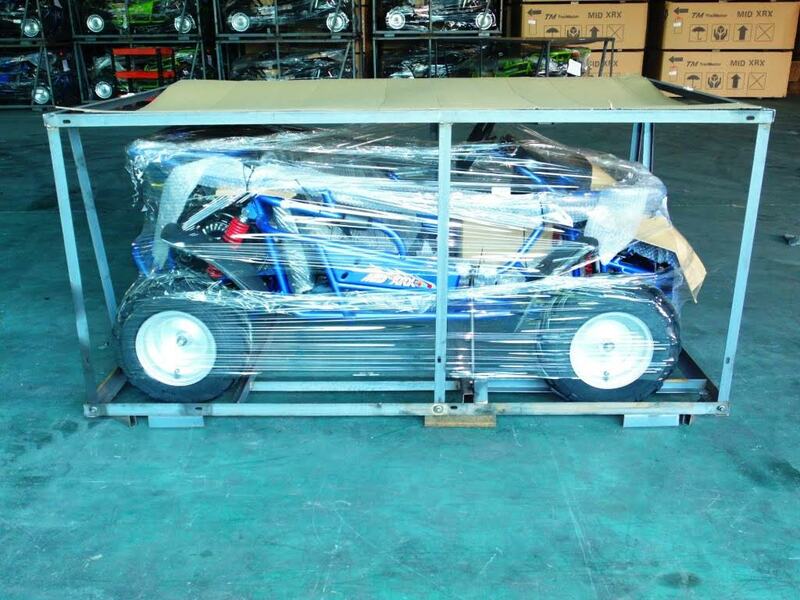 Your go-kart will arrive to you mostly assembled. For most go kart models, assembly will take 1-2 hours. Times may vary depending on skill level. Assembly generally includes installing the wheels, upper bars, steering wheel, installing accessories (if applicable) and preparing the kart to drive (add fuel, check oil, set tire pressure). The main frame, engine, drive system, axle, and wiring assembly will have already been completed by TrailMaster at the factory. Brakes Rear Hydraulic Disc. 2 Wheels. Seat to Pedal Distance 34" - 37" 34"-39" 34"-39" 34"-39"
TrailMaster Mid XRX-R Go Kart w/ Reverse - Ships FREE!!! TrailMaster Mid XRX Go Kart - Sale - Ships FREE!!! TrailMaster Blazer 200R Go Kart w/ Reverse - Ships FREE!! !